Lloyd Swanton, Tony buck and Chris Abrahams: the journey continues. Photo: Matias Coral. Of late the Necks’ three members have routinely charted three parallel courses in their long improvisations, with points of intersection or convergence being optional. Here they responded to one another harmonically and rhythmically for most of both journeys, and the totality of the interaction in the first was close to miraculous. Bassist Lloyd Swanton launched it with a strummed ostinato that left the field wide open for pianist Chris Abrahams and drummer Tony Buck. Even when Buck added rhythmic chatter with a shaker and a brush this was still music in limbo, until Abrahams made it concrete with a crystalline refrain that, paradoxically, also felt so fragile it might snap. Initially Abrahams just draped these delicate wisps of melody over the soft, insistent pulse, but as the density swelled the cohesion became so profound that the band sounded as if it were one person and a whole orchestra simultaneously. The anguish of Swanton’s bowed harmonics was almost swept away by the rhythmic deluge unleashed by the others, and when he put the bow aside the denouement commenced: a slow unwinding to a unison ending that had all the inevitability of a notated composition. This was the finest work I’ve heard from the Necks in the flesh. Ever. The second improvisation had flashes of such heights without the consistency. It began with a lyrical little dance from the piano that seemed so self-contained one wondered how the others would find a way in. When Swanton opted for a repeated long, low bowed note, Abrahams dashed his motif into fragments, as though looking at it through a kaleidoscope. Buck’s entry was sparse, his tinkling bells – being close-miked and heard through overhead speakers – resembling rain, to which he added a heartbeat pulse on his floor-tom rim. Collectively they constructed a monstrous intensity, but also something of a stasis, which Swanton broke by again using bowed harmonics, this time to striking bird-like effect, the piece concluding with willowy, jazzy piano. 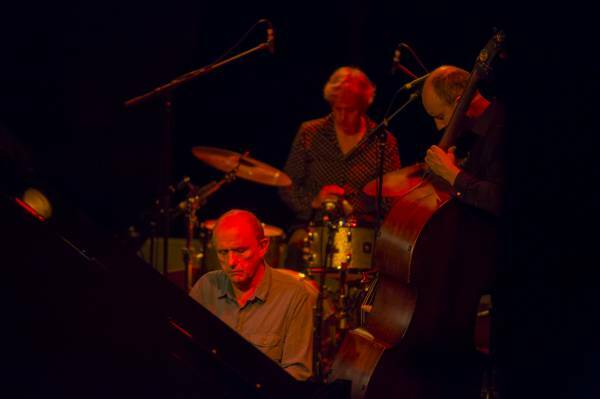 The Necks: Camelot Lounge, February 25-26, March 3; Blue Mountains Theatre, March 2.